Let the 2018 Hiking/Backpacking Season Begin! The 2018 hiking/backpacking season is in full swing-in (where else?) Florida! If the latest report from Sandra Friend (Florida Trail Hikers Alliance) is any indication, 2018 is shaping to be a banner year, not only for thru-hikers on the Florida National Scenic Trail, but also for hikers (in record numbers) coming out of Florida on the Eastern Continental Trail. “Good morning Eb! Here’s the full list of ECT Hikers. They’re scattered from the Keys to the Suwannee. All are looking forward to meeting you. Will Dukes, Christopher Ellmann, Tony Flaris, Matt Softwalker Halfar, Joe King, Jeremy Knopp, Matt Gator Miller, Emily Fine Line Rhodes, Albert Ninja Tortoise Scott, Theresa Sheahan, and Cory Last Buck Talbert. Ah yes folks, 2018 is going to be a great year for hiking/backpacking! So, grab your pack, head south–and let’s hit the trail! From time to time I post information and articles on my announcement page, sharing news about accomplishments and/or specific happenings of fellow hiker friends and acquaintances. Once the article is old news it gets removed to make room for more current items, however, I have always felt that some of the information should still be available. To that end, this section has been created to archive such articles and news items. Nimblewill’s friend, David Breen Summits Kilimanjaro! My dear friends, John Keatley and Sandra Friend have written yet another wonderful book about the Florida National Scenic Trail. If you’ve not yet had the opportunity to experience the Florida Trail first hand, then this book is for you. Ah, and even if you’ve hiked it extensively, this book is chock full with pictures and descriptions of all the beautiful places you just may have missed. I highly recommend The Florida Trail to you! Pacific Northwest National Scenic Trail has a new website. If you’re interested in learning more about the Pacific Northwest National Scenic Trail (PNNST), one of our three new trails, there’s a fantastic website now up just for you at www.PNT.org. Click on Odyssey 2010 PNNST in the Site Menu to the left for Nimblewill‘s take. According to Nimblewill, “It is one of the most scenic footpaths in America! ODYSSEY 2014 ONHT: Is now completed! 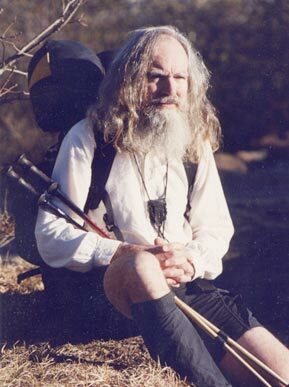 Nimblewill had long pondered concluding his long-distance hiking “career” with this past-year’s journey, Odyssey 2013. However, after much encouragement from family, friends, and fellow intrepid–and considering the Lord’s continued blessings of good health, stamina, and resolve, he’s decided to keep trekking on. And so for 2014, Odyssey 2014, his plans were to take another journey back through time, by thru-hiking one of the greatest trails in all of American history, the Oregon National Historic Trail. The Nimblewill created his route maps and completed his itinerary and, on April 28 he set out for Independence, Missouri where the journey began for Odyssey 2014. Sunday morning, August 24th, Nimblewill arrived End of the Oregon Trail Interpretive Center, Oregon City, Oregon, successfully concluding his thru-hike o’er the Oregon National Historic Trail — 117 days, 2,109 miles. NOTE: The journal entries are complete, however the photo albums and video do not take you all the way to the end of the ONHT. The Nomad did continue to take photos and videos all the way to Oregon City but technology dictated a sad (and irretrievable) outcome. It appears the camera SD card was demagnetized somewhere along its line of travel in the US Postal Service. With that being the case, the mfg. confirmed there was no way the images/video could be recovered. We’re very sad about this loss, and very sorry we are not able to share the Nomad‘s last days on the ONHT with you. At 9:30 Friday morning, June 28th, the Nimblewill Nomad reached the intersection of FL-87 and US-90 east of Milton, Florida, to successfully complete Odyssey 2013, the Great American Loop (GAL). A trek of 1,555.5 miles, entirely a roadwalk, and a very difficult go at times. Thanks to all who offered their support and encouragement — true blessings! Odyssey 2013 was destined to go down as an extraordinarily grand affair, perhaps Nimblewill‘s final adventure, one he chose to call the GAL (Great American Loop). Over the years, having envisioned no grand scheme, with no predetermined design or plan, dawned on the old fellow a year or so back that he was well on his way to trekking down the outer fringes of the entire lower 48. Yup, a path clear around our beautiful US of A–all four corners, all four sides. If you’ve followed the old intrepid’s wanderings even the least over the years, you’ll know how he likes to connect places, hook them together, by trail, roadwalks, bushwhacks, whatever it takes. His very first long trek pieced together road and tread, a trail spanning near the breadth of the eastern North American continent. It’s since become known as the ECT (Eastern Continental Trail). In 2004-’05, a young, ultra long-distance hiker named Andy Skurka became the first to hike an amalgamation of roads and tread known as the C2C (Sea-to-Sea Route), a trail crossing the upper reaches of the United States, from the Atlantic to the Pacific. In 2007, not content, Andy kicked up a cloud of dust that hasn’t settled to this day. He hooked the Continental Divide and Pacific Crest National Scenic Trails together, then to hike that amalgamation in one continuous trek, a trail he’s named the GWL (Great Western Loop). Since, and to chime in the least, Nimblewill has cobbled together his own versions of the GWL and C2C. And so, as for the GAL, of the near-countless miles around and across the lower 48 Nimblewill has hiked over the years (the byways and trails), connecting 18,257 of them now track the entire GAL–now including the 1,555.5 miles from the Continental Divide Trail in New Mexico to the Florida Trail in the Western Panhandle. So, as to this last segment of this last and final leg, as to the completing of it to close the loop that is the GAL? Well, that’s what Odyssey 2013 was all about! Winter’s coming, but hey–we don’t have to put our packs away till next spring. Let’s head for Florida! There’s a really great trail down there called the Florida National Scenic Trail. Believe me, folks, the Florida Trail is a remarkably fun hike (the old Nimblewill has trekked it twice), whether we choose to hike it all the way, or perhaps do just a section. And to support and help us along? What better than the all new guidebook by Sandra Friend and John Keatley, The Florida Trail Guide – Logistics for hiking and backpacking the Florida Trail. So, load up; let’s go–Florida here we come! Noon Sunday, September 9, 2012, Nimblewill Nomad reached the summit of Grand Monadnock Mountain, New Hampshire, thus completing his trek o’er the New England National Scenic Trail. And as to the significance of that day? Well, it marks the successful conclusion of Nimblewill’s quest to hike all eleven of America’s National Scenic Trails. He now becomes the second person, behind Bart Smith, to have documented this accomplishment. From left to right: Chickety, Honey, Neighbor Dave, Nimblewill Nomad, Slider. The Nimblewill Nomad successfully completed his trek along the Ice Age Trail on August 12th, a little before 6:00 p.m., 45 days, 1100 miles. In his own words the Nomad says, “Through His Grace, I was granted wide, safe passage — angels resting both my shoulders.” The a;; journal entries, photos, and videos have been published to the Odyssey 2012 IAT section. During the Devil’s Lake segment, and on the final day to St. Croix Falls, the Nomad had a trail companion. His name is Dave Caliebe (another IAT thru-hiker 2010). Please visit Dave’s blog pages for his account of time spent with the Nimblewill Nomad in the Devil’s Lake area and on the Nomad’s final day on the IAT. September 9, the final day of this journey, Odyssey 2011. You may recall this Triple-O hike was supposed to be a warm-up, purpose being to whip me into shape for trekking the final two National Scenic Trail(s), the Ice Age and the New England. But rather than whipping me into shape, this Triple-O has just plain whipped me, pure and simple. I should have been in Little Rock no later than mid-June. It’s now going on mid-September! I’ve been humbled before, but it’s been awhile since I’ve been as firmly slammed in place—like the whipping these three trails have laid on me. And as to the virtue of patience? Oh my, daily do I pray for patience in all ways. Sitting around 18 days, waiting while my knees came back, then sitting again for nearly two months, waiting for my broken leg to heal—all those days spent just sitting (and waiting)—thank you, Lord, for a new appreciation and understanding of patience—and for granting me the strength (and patience) to endure. Please enjoy trekking along with the Nomad in this journey along the Triple-O, an amalgam of three National Recreation Trails, spanning Missouri, Arkansas, and Oklahoma. Of the 500 miles of proposed trail in Missouri, some 350 miles of the Ozark Trail have been completed. Isolated sections are interconnected (for now) by somewhat lengthy roadwalks. It’s a scenic-but-rugged trail, as it traverses the highest land between the Appalachians and the Rockies, the Ozark Mountains, as they’ve come to be known. And these Ozark Mountains? Well, they could be more correctly categorized as highlands, since they sprawl across an elevated, deeply dissected plateau. And for sure, the region is unique, certainly as to its culture, in both folklore and folksong. The descriptive term Hillbilly, or Ozark Hillbilly; they’re pretty much synonymous (Yup, that’s Nimblewill!). It’s a remarkably diverse region. Here can be found mountainous terrain marked by deep valleys through which clear, meandering streams flow. Caves are numerous. Hillsides throughout are heavily forested in oak, hickory, and pine. Minerals abound. Agriculture, forestry, mining, tourism, they’re the mainstay. The Nomad completed his Triple-O odyssey on the Ouachita Trail, which stretches 223 miles through the beautiful Ouachita Mountains of Arkansas and Oklahoma. The first 192 miles lie within the Ouachita National Forest; the remaining 31 miles, maintained by Pinnacle Mountain State Park, traverse lands owned by timber companies and Central Arkansas Water. However, to make his Amtrak connect in Little Rock (to head home at journey’s end) the Nomad hiked this trail in reverse, picking it up at Talimena State Park, in Oklahoma, crossing into Arkansas, traveling through Queen Wilhelmina State Park, and ending the odyssey at Pinnacle Mountain State Park, near Little Rock. From there to the Amtrak and home. Nimblewill Nomad and Webmaster, CyWiz, have been working diligently the past number of weeks creating an entirely new page for your enjoyment. It’s about a fascinating long-distance trail known as the Sea-to-Sea Route. Perhaps you’ve heard of it, perhaps not. If, not, it could be because, to date, only two people have hiked it. You see, it isn’t your ordinary, everyday trail. Being transcontinental in magnitude, it stretches clear across our great nation (from sea to sea), some 8,000 miles–give or take a few hundred one way or the other. We’ve had fun putting the page together for you. There, you’ll find informative narrative, some neat maps. To access this latest feature, just click on C2C 2000-2010 in the Site Menu to your left–and enjoy! The past year was a most rewarding year for Nimblewill Nomad. Early on, he’d set as his hiking goal for 2010 to thru-hike both the Arizona and the Pacific Northwest National Scenic Trail(s). Ah, and did those plans work out so very well! On June 8th, after 38 days trekking north through Arizona, he reached the Grand Canyon, and three days later, on June 11th, he completed his trek o’er the Arizona National Scenic Trail. Then, on September 21st, after 65 days enduring rugged mountainous terrain through northern Montana, Idaho, and Washington, he reached the Pacific Ocean, successfully concluding his thru-hike o’er the Pacific Northwest National Scenic Trail. If you’ve not yet read Nimblewill’s account, his day-to-day entries, if you’ve not viewed the remarkable photos, watched and listened to the interesting videos—all are available for your enjoyment. So, you’re invited; come along on these remarkable adventures with him. Just click on Odyssey 2010 AZT or Odyssey 2010 PNT and enjoy! First, the Fest was Dahlonega’s way of expressing their pride–the honor of being selected as an Appalachian Trail Community. You see, along the entire length of the Appalachian National Scenic Trail , to date, Dahlonega makes only the fifth community so recognized. A true honor, indeed. Congratulations, Dahlonega! Second, this well-deserved honor/recognition served to pave the way for a long-needed kickoff celebration–a (less than formal) event marking that decades-long grand beginning. And that beginning? Well, it became known as the hike of a lifetime–the annual pilgrimage north for thousands of wayward intrepid, those who set out to thru-hike the Appalachian Trail–that historic path that winds its way through the mountains and valleys of 14 states, from Springer Mountain, Georgia, to Mount Katahdin, Maine. Ah, and don’t-ya-know, and what a very special honor; for as it’s turned, the old Nimblewill Nomad, (who takes his trail name from that very special place just below Springer Mountain–Nimblewill Gap), was invited to be Keynote Speaker for this first ever event; just a great honor! The Alabama Hiking Trail Society tenth annual conference was a resounding success—huge turnout/attendance, much contagious energy and enthusiasm. Monte Sano State Park, near Huntsville, just a spectacular facility. Nimblewill shared a joy-filled time with many dear friends—and lots of new ones, too!His Keynote Address Saturday evening was well-received, as was the beautiful from-the-heart music performed by Jan Dutch Treat Benschop. During the evening activities, John Mother Natures Son Calhoun was presented the coveted “AHTS Volunteer of the Year” award, and Joe Cuhaj was elected incoming president. Congratulations, John, for work well done, and all the best, Joe, for AHTS in 2011! Advancements, improvements, new trail (in entirely new countries for the SIA/IAT) seem never-ending. The Eastern Continental Trail Guide (ECT/AMT, Site Menu to the left) is certainly outdated as to this dynamic international segment. Take a moment and check out what’s currently going on in Nova Scotia, Prince Edward Island, East Greenland, and across the ocean in Ireland, Scotland, Wales, Norway, France, Spain, Portugal, and Morocco. Be sure, though, and look at this report (and spectacular photos) about the Newfoundland Starlight Trail by IAT President Paul Wylezol. Oh, and isn’t it always neat to follow fellow intrepid, as they wend their way along the ECT, from Key West, Florida to Belle Isle, Newfoundland. lil’ buddha (Says he’s little and looks like Buddha!) is a great hiker–and an excellent writer. Want to indulge yourself in true adventure, check this hike out! February 19-21 IATNL Chairperson Paul Wylezol, Communications Director Greg Wood, and Treasurer Kevin Noseworthy attended the Boston Globe Travel Show. The IATNL was an exhibitor with its own booth to promote the International Appalachian Trail. On February 19 they were joined by IAT Maine members Richard Anderson, Will Richard, and Walter Anderson. The International Appalachian Trail runs through Maine, New Brunswick, Quebec, Prince Edward Island, Nova Scotia and Newfoundland and Labrador. In Western Newfoundland this long-distance hiking trail extends from Port-aux-Basques in the south, through Gros Morne National Park, to Crow Head (just east of L’Anse aux Meadows) at the tip of the Great Northern Peninsula. No, these aren’t adventures led by the Nimblewill Nomad, but they are adventures offered by an organization founded by two women, Meg Letson and Rachel Pomerantz, in 2004, who had a chance meeting with the Nomad, on the Pinhoti Trail, back in the year 2000. This encounter inspired these ladies to envision offering an affordable, accessible, and creative wilderness adventure experience to others. To them, Nimblewill Nomad symbolizes the inspiration, perseverance, commitment, and possibility that supported their creation of Nomad Backcountry Adventures. The Grand Traverse Hiking Club, one of 40 chapters and affiliates of the North Country Trail Association, celebrated National Trails Day 2009 with Senator Carl Levin (D-MI) officially opening a new spur trail linking the North Country Trail to the cities of Kalkaska and Traverse City. In a ceremony that also featured North Country Trail long distance hikers Joan Young and “Eb” Eberhart, aka Nimblewill Nomad, the GTHC recognized partnership efforts by the Kalkaska Area Recreational Trail and the Traverse Area Recreational Trail. These organizations along with GTHC and the NCTA worked together to create the newly opened spur, which enabled the linking of all the major trail systems in the area. Photo: Senator Carl Levin, Joan Young and Eb Nimblewill Nomad Eberhart cut ribbon on new NCNST connector trail near Traverse City, MI. Most all the national news we’re fed anymore, almost all of it is negative. Dear friends, it doesn’t have to be like this, especially when there’s so many great personal triumphs to cheer about out there, ones that constantly get swept under. What say we change this news agenda! For beginners, why don’t we insist this article about my longtime hiking/backpacking friend, Alvis Paw PawKinney get national attention through AP and UPI? Please give a look. God bless you, Paw Paw. And thanks for your sacrifice and service to this great USofA! Sue Hammock Hanger Turner – First Person to Hike G.E.T.